In advance of the meeting, I wrote a long letter explaining my background and listing my questions. One of them concerned my growing a beard, which my parents were totally opposed to. They thought that this was unbecoming and would disadvantage me and make me unemployable. I knew that my parents meant the best for me. And yet, the Torah requires that a man not cut “the corners” of his beard, which is why Jews wear sidelocks, and many don’t cut any part of their beard at all. So I did not know what to do. The Rebbe’s answer puzzled me somewhat. He said that, since I would be returning to Australia via Israel, I should stop at four holy places and pray about my dilemma. He did not tell me whether or not to grow a beard – he just told me to pray at these four holy places about this matter and then to reach a decision there on my own. The four places the Rebbe named were: the Western Wall, the retaining wall of the Holy Temple in Jerusalem; the Cave of the Patriarchs in Hebron, where Abraham, Isaac, Jacob and their wives, Sarah, Rebecca and Leah are buried; Rachel’s Tomb near Bethlehem, the final resting place of Jacob’s beloved second wife; and the Tomb of Rabbi Shimon Bar Yochai, the author of the primary text of the Kabbalah, in Meron. 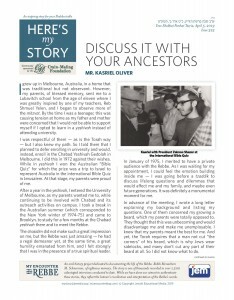 “After praying at these places, you should return to Australia and tell your parents that you made a decision,” the Rebbe said, predicting that, when I did so, they would go along with whatever decision I made. His advice helped me a great deal. I went on to study at the university with a full beard – which my parents accepted, as the Rebbe said they would – and I graduated with a degree in applied chemistry. Later, I became the chief chemist for Kosher Australia, a position which I have held for the past thirty-six years. My job entails auditing and assessing all aspects of food production and ingredients to determine possible kosher certification. This requires extensive and detailed knowledge of raw materials and the latest food technology. I am not the rabbi who gives the kashrut certificate, but I am the chemist who provides the technical details of the ingredients and the manufacturing process. It is an important job, and I think I have made my parents proud, and I hope the Rebbe as well.